Inspired by a gorgeous pair of metallic cinnamon shoes I decided to feature metallic handbags as there are so many around and perfect for the festive party season. I'm particularly partial to the warmer tones of rose gold, copper and bronze at the moment but many of these bags come in metallics other than the colours featured here eg. silver so don't forget to visit the websites for other options. In blush pink leather with a brushed brass lock closure this classic style. The matching leather shoulder strap is adjustable and also removable as it sits on hidden poppers within the bag itself, so clever. It has our signature cotton striped lining, a built in coin purse, as well as a zip compartment and pockets for phone/diary. Miniaudiere Frame Evenine Clutch. Removable matching cuff. Chain to attach to cuff, for use as a short strap (8"drop), or removable. Approximately 6.5" x 3.75" height x 2" depth. Made in Italy. Hold it, or let it hang elegantly from a wrist - this is the answer for those who like to take all of their essentials with them. Our popular wristlet has room for an iPhone, credit cards, keys, notes and change. 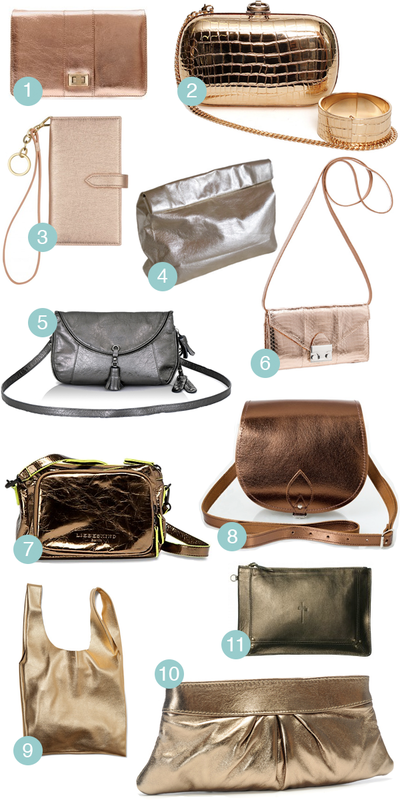 All of these essentials are wrapped in one chic, metallic package. The inside is lined with an orange suede, and is finished with a detachable leather strap. Based on a brown paper bag, the LUNCH is sized in-between the PICNIC and the DINNER. Unlined. With an interior pocket. Approximately 10x7x3 inches. Made in California. The Lock Wallet in metallic rose gold watersnake with shiny silver signature push lock. A convertible wallet with removeable leather cross-body strap for multiple uses. This saddle bag is handmade using bronze metallic leather with matching brown stitching and a silver nickel buckle. Our simple shape made of the softest natural milled leather. Comfortably fits over the shoulder. 14" wide / 24" tall / 4" gusset / 10" handle drop. Made in NYC. Like the best back-up singers, Eve complements you without stealing the spotlight. Classic shape in a size subtle enough to accompany any ensemble. Opens with a hexagonal frame. Signature striped shimmer lining. Made in NYC. 11 inches wide x 4.5 inches tall. Little case with metal hoop on the side. Material: Lambskin. Dimension: 21x30x0.5cm. Weight: 92g.